NBC Sports once again will have Sunday Night Football in 2013. For all of you rabid NFL fans who can’t watch the game on TV, the fine people over at NBC have you covered with SNF Extra. 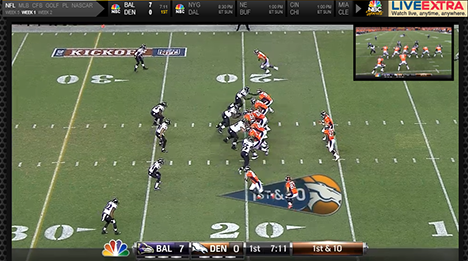 With SNF Extra you can watch every Sunday Night Football Game of 2013 live online. NBC has made a few changes for the 2013. The most important is that link has been updated and the old link from previous seasons does not appear to forwarded to the new location. So, you’ll want to update any bookmarks from last year. They also have the option to turn on closed captioning and big play markers that allow you to jump back to touchdowns and other big plays in the game. You can launch the SNF Extra Player here at NBCSports.com. The video usually becomes available shortly before the game begins so if you tune in early, you are likely to see players warming up and preparing for the game. The video player can also be expanded to full screen by clicking the icon at the lower right. There are 5 different exclusive camera angles available in the PIP box which can be swapped with the main camera feed. 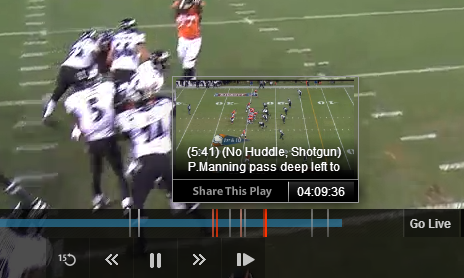 The SNF Player has DVR style controls allowing you to pause, forward, rewind, or jump back 15 seconds. Big play markers let you go back and re-watch scoring plays and other significant moments in the game. By scrolling down you can find stats and social media stuff like the ability to tweet questions to ProFootballTalk’s Mike Florio. SNF Extra is a more than acceptable way to watch an NFL Game. NBC advertises HD, and the picture can be quite good, but we experience occasional reduced quality video as the bandwidth fluctuated. You get the “real game” as broadcast on NBC in addition to the exclusive extra camera angles. This is really nice when compared to some products that are more along the lines of a supplement to the TV telecast. You will notice that the SNF Extra stream is typically 30-60 seconds behind the TV broadcast, so keep this in mind if you don’t want “spoiler” tweets or texts from friends. We’d also be remiss if we didn’t mention that Verizon Wireless customers can also watch Sunday Night Football on their iPhone or Android device with the NFL Mobile app by Verizon. Follow all the latest from NBC Sunday Night Football at snfallaccess.nbcsports.com. UPDATE (9/2013) – It appears that Safari is the now only supported browser on Mac computers. On Windows PCs, it appears that all major browsers are supported.